For fast, easy, inexpensive mounting, without the mess of glues or sprays. ELMER'S Self-Adhesive Foam Core Board has a pressure-sensitive liner that peels away from one side of the Self-Adhesive foam board surface creating a high-tack adhesive. Elmer's self-adhesive foam board is available in either Black or White, and is ideal for mounting photos, comps, prints, artwork, posters, layouts, etc. Elmer's self adhesive foam board, also referred as Quick-Stick, provides a neat alternative to messy sprays, and allows for re-positioning before pressure is applied. Elmer's Self adhesive foamboard sheets are packed with cardboard corners for extra protection. Sold at a wholesale price. Rick was very helpful and seemed to have extensive knowledge of this product. It’s far more superior than what we were using at our agency. SO Much better than the cheap crap that your competitors sell. Thanks for allowing us to pick up in your warehouse! Just discovered Buzzline! Thanks for easy transaction and prompt delivery! Great product! Will purchase again. 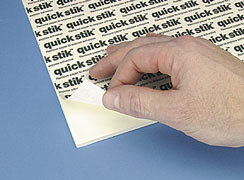 This self adhesive foamboard eliminates the need for spray adhesive! The adhesive is very permanent. This foam board is great for mounting our wide format posters. Our company received a better price and discounted shipping based on a larger volume. Expected delivery within a week, we received within 3-days. Best price and best service online!!! Thanks again.